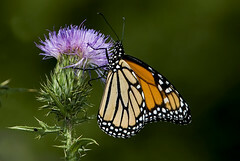 For part 3 of my ID series, I’m going to look at what are arguably the most well-known butterflies in the U.S. – the Monarch (Danaus plexippus) and related species. 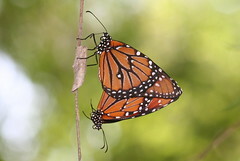 I call them the ‘royal butterflies’ – Monarch, Queen (Danaus gilippus), Soldier (Danaus eresimus) and, although technically they are in a completely different genus, Viceroy (Limenitis archippus). 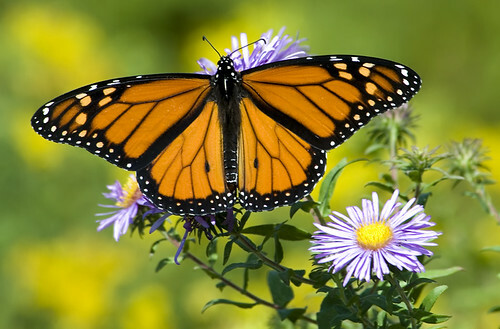 The monarch butterfly is the best-known and recognized butterfly in North America – not only is it present through much of the country, but it’s bright coloration and large numbers make it a common resident where it is found. It is also perhaps one of the most well-studied butterflies, as scientists have studied their migration from central Mexico to the U.S. intently. 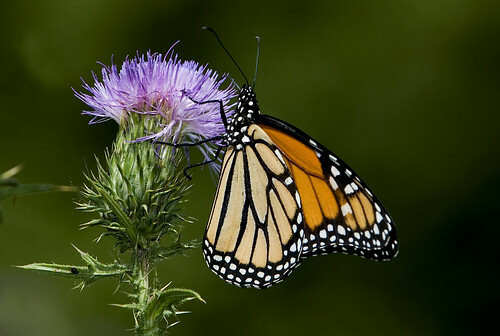 Additionally, many children’s first experiences in school with butterflies involve the monarch because of the ease of raising the caterpillars through their development into adults. 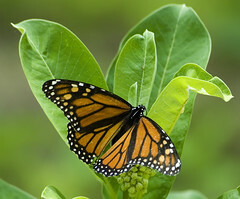 Monarchs are easily recognizable based on their large size, vibrant orange-black and yellow coloration and their commonness, particularly around their major foodplant: milkweed. 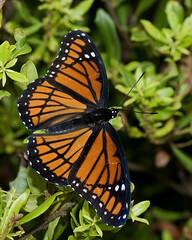 They are primarily orange on the dorsal side, with orange or yellow with heavy black barring throughout the wings. Their bodies are black with white spotting along its length. 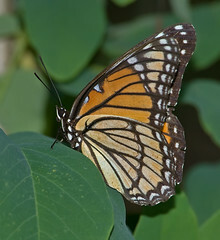 Males and females are very similar but there is a distinctive difference between them – males have two small ‘scent patches’ at the center of the hind wings. Below, you can see pictures of a male on the left and a female on the right. The butterfly most commonly confused with the monarch is the Viceroy (Limenitis archippus), a mimic that is in a separate genus. Smaller than the monarch (2.75″/7.5cm average vs. the monarch’s 4.25″/10cm average), they are more easily distinguished by a black line along the mid-point of the hindwings. They also have a short row of white spots along the marginal band of the hindwing. Interestingly, viceroys are excellent mimics that can look strikingly different based on their region and what other species are in the area. 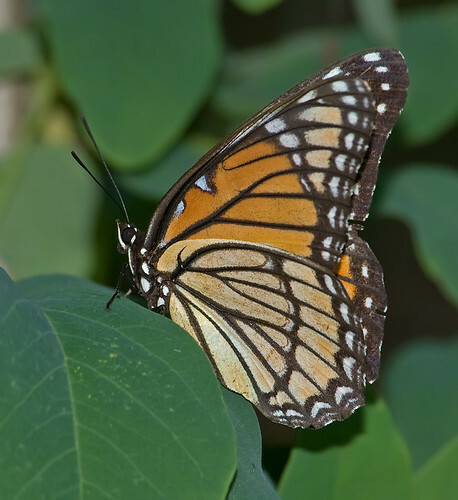 It has been noted that in the deep south, where monarchs are less common, viceroys tend to appear more similar to queen butterflies; in the American southwest, they mimic the more common Soldier butterflies more often than monarchs. 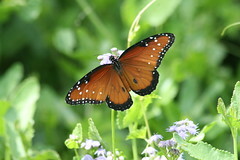 Soldiers are more similar to the queens, but are darker, have black veins in both the forewing and hindwing and squarish white spots along the midline of the hind wing. They are also rarer in the U.S., occurring primarily in the more southern ranges of the country, especially compared to the wider range of the queen. Here are some great resources for IDing butterflies in the NJ-MD-DE area (and country at large). • Butterflies through Binoculars – The East by Dr. Jeffrey Glassberg. An indispensable guide to butterflies in the eastern U.S.
• Butterflies and Moths of North America Maps. The official butterfly site, as it were, with state checklists of butterflies. • Bugguide.net. A great site for information on all types of insects (and related bugs, such as spiders) in North America. LOL … I don’t know – I guess I’ll have to look that one up. Very informative once again, Marty! I had to look closely to see the differences between the Viceroy and the Monarch, even with your description. They just look so similar. My all time favorite butterflies and looks like this mon@rch is still searching for its Queen! Great job with this post!